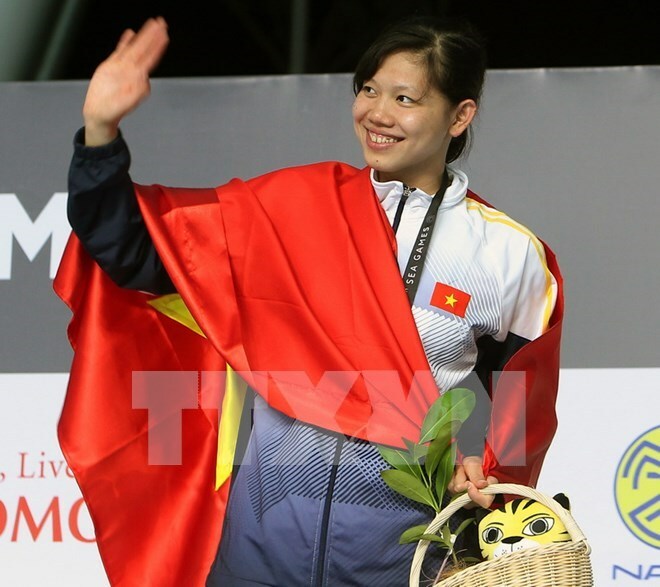 Kuala Lumpur (VNA) - Vietnamese swimmer Nguyen Thi Anh Vien on August 22 grabbed a gold medal in the women’s 400m freestyle category at the ongoing 29th Southeast Asia Games (SEA Games 29) in Malaysia. Vien clocked 4:10:96 and bagged the third gold at the SEA Games 29. Previously the same day, Vien won a gold medal in the women’s 200m backstroke category at 2:13:64, breaking her own previous SEA Games record of 2:14:12. Vien also broke the previous SEA Games record and pocketed the first gold medal in the women’s 100m backstroke category on August 21. Meanwhile, track & field athlete Nguyen Thi Huyen broke the previous SEA Games record and won a gold medal in the women’s 400m hurdles at 56:06. Vietnam have sent more than 470 athletes to the SEA Games 29 in Malaysia from August 19-30. They are scheduled to complete in 32 out of 38 sports with more than 6,000 rivals from 10 other countries in the region. The country is set to grab 49-59 gold medals to rank in the top three.